A en&amp;sl=de&amp;tl=en&amp;u=http://www.notebooksbilliger.de/microsoft%2Barc%2Btouch%2Bmaus has prematurely posted (and very quickly taken down) details and product shots of the upcoming Microsoft Arc Touch mouse. The Microsoft peripheral is innovative more in its form than its function, but along with the Apple Magic Trackpad it hints at a future where the mouse may no longer have a role. The Microsoft Arc Touch is a 2.4Ghz wireless mouse. It communicates with a standard USB receiver. The innovative form comes from the ability to fold flat for transport and into an arc for use, and from using a touch-sensitive strip in place of the standard scroll wheel. I remember the first time I encountered a mouse. The concept of the graphical user interface, and pointing and clicking with a mouse were both foreign and mystical at the time. My friend's Mom worked for Apple and he had an original Mac while I was still coding in BASIC on my Commodore 64. For the almost quarter-century since that time the mouse has essentially remained the same. Sure, it went from having a trackball that gets all dirty and gummed up to using laser optics for more accurate and fluid tracking. And, there have certainly been an array of variations in basic shape and button configurations. But, the mouse is universally understood as an input device. 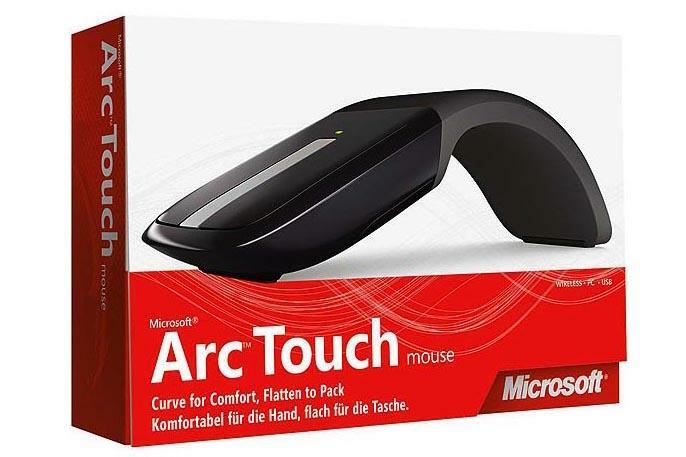 The coy unveiling of the new Microsoft device, and the name Arc Touch seem to imply some sort of reinvention of the peripheral, but the Arc Touch mouse is still a mouse. Yes, it looks slick. Yes, it collapses flat for travel and folds up into an arc (hence the "Arc" part of the name) for more comfortable "mousing". Yes, it has a touch bar (hence the "Touch" part of the name) in place of the ubiquitous scroll wheel. In the end, though, it's just a fancy mouse. However, Apple--responsible for introducing the mouse to mainstream computing--has introduced a new peripheral that it hopes will spark a new revolution in computer interactivity. The Apple Magic Trackpad is basically the same sort of trackpad that you find built-in to most laptops as a pointing device, but the Apple gadget is larger and includes multi-touch capabilities to provide more functionality such as pinch-to-zoom. Perhaps the mouse is passé. Wired mice have the obvious handicap of being tethered to a limited range and constantly getting the wire tangled or caught. Wireless mice still have an issue with desktop real estate and battery life. With the trend toward touchscreen smartphones and tablet devices, interacting with technology is increasingly about letting your fingers do the walking. The iPhone and iPad have made touchscreen interfaces and multi-touch gestures mainstream just as the original Apple Macintosh made the mouse mainstream. The mouse is an integral part of PC history, but perhaps it's time we move on and let it rest in peace. We're not really there yet. I have a touchscreen monitor at my desk, but it's too high and too far away for pointing and swiping to be the primary method of interacting with my computer. The Microsoft Arc Touch, and the Apple Magic Trackpad both still sit next to a keyboard and don't change things much. If the mouse does die, I can't say I will miss having an extra device taking up space on my desk.